I have noticed white roof on altis too. 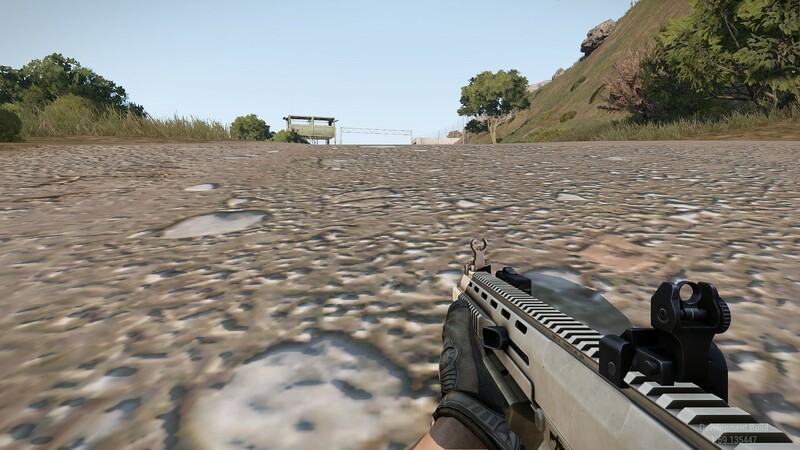 One thing that was missing in the OPREP, is the change of road textures. While I think the new textures look better, their resolution is beyond bad. What was the reason for that decision? My texture setting is on Ultra. you are rigth, this road was changed too, and it needs more love. I will do improve that. The reason for change this was effort for better feeling of the road. This change was not the main point of Visual update. with this upgrade the ground textures were made darker? on Altis and Stratis looks good! There was some guy here on forums who speaks with TrueSky developers - they said they fixed it fully. Yes, ground textures are now more darker, and materials are set to 1,1,1 (RGB) for a diffuse and ambient. Could we get a filter to darken the UW-world,to make it more murky,sence we will use this a lot to make Seals-type gameplay,where you in real life will be able to sit on the bottom of the Harbour and we will be totally invizable to the one looking down at us. You are getting there.Keep it up.We will need to have it in such a way ,we will actually need a flashlight.Water is full of particles and just a few meters down-it`s impossible to see-or make out what things is. 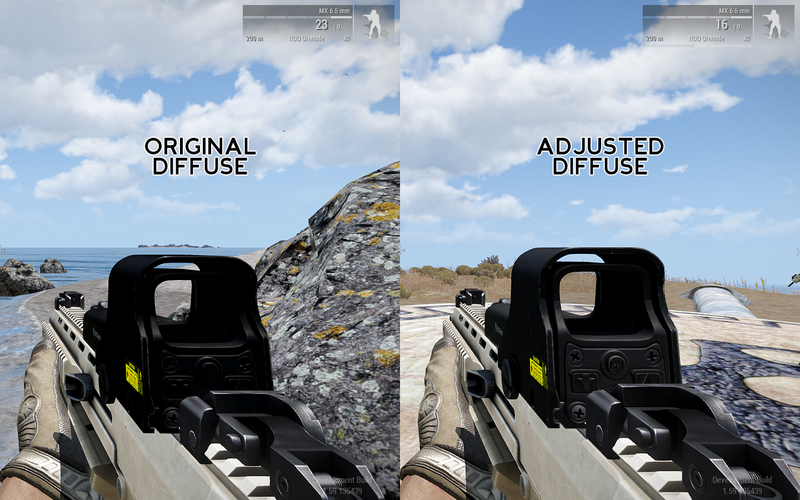 Is there any general advise that the art team has on necessary changes to textures to fit the new lighting and colour grading? Or is it something you tackled on a case-by-case basis looking at each texture/model? I had noticed on one of my models that used a bunch of near-black tones (all < [12,12,12] RGB) that the tone mapping caused all of them to crush down to a very homogenous black colour. Whereas the grey variations were more apparent on the model in the old lighting system. The new lighting is more contrast so very dark and very bright pixels can be out of the range. There are two ways how fix too dark part of your models. please consider these requests of mine. #1. i would like better quality rocks, boulders and exposed granite cliffs on rugged shore lines in both altis and stratis. I personally don't think currently the rocks and boulders look realistic at all. I have played 'Vanishing of ethan carter' the quality of rocks there is great. they indeed do look very realistic. they are using this process called photogrammetry. Can you please use this process to create your rocks and their textures, or steal their digital assets :) Also if you could do the same with the trees as well. #2 How about some crashing waves on rugged granite clilffs off the stratis shore line. Currently seems like stratis and altis are some islands in a lake.
. and yes i am using rotorlib afm. This not the dev branch, i am using some sweetfx post processing stuff and that why it looks a little different from vanilla. For the screen shots i have seen from you guys i will surely be ditching the sweetfx after your updagrades are included. oh, one more thing: can the pine grooves (founds all over in altis and stratis) can be more tightly packed. while flying over, one can see the ground which i don't thing should be possible as tree canopy usually blocks the ground in forest. Dwarden, are you sure that the cloud issues aren't solved in the latest version of TrueSky? As I wrote in another thread (even in the Feedback Tracker), I got in contact with Roderick Kennedy, one of the developers of TrueSky, in October 2015 and asked him about that issues (wobbeling clouds). "Thanks very much for your message. In the latest version of trueSKY, this issue is fixed, due to our new rendering approach. I don't understand much of programming but I really thought an update of the TrueSky API might do the job. - There is too much contrast in low-light situations. Blacks are too black and light does not spread well. Seems linear decay. - Some rocks seem made of rubber. - Some very white textures are burned. Some captures after making tweaks. if we could have the ground textures aka terrain color like it was before visual update, would be great. After today update is still toooo bright, affects every single island, but those who have less vegetation and/or less grass the ground just become white. All the rest is perfectly fine and awesome. Ground textures on Altis are very long to load (this link) since Friday update. I don't know why, it's maybe not related. When I move the camera at ground level, road texture load way faster than other ground textures. I defragged my HDD but it didn't fixed anything. choose a place, right clic on it and use "move here"
I did a comparison of stable and Dev branch with the new visuals. Using the same mission marksman showcase. Apologies for pics but on phone. For me Dev branch new visuals blows stable away. Thought I try today's update to see if there are any performance improvements and it has got even worse. Honestly I'd be happy enough to stay on 1.56 but this 'upgrade' will have made my APEX pre-order as useful as a chocolate teapot as I can't even install it without making the original game unplayable. I'm not sure this is 100% related to new visuals. Alot have had no problems. Thats not to say on general discussion a few people have reported performance problems but being related to anything other than being a Dev branch is not clear. Go general and post settings set up. Might help. just some generic feedback and some shameless plugs for a few semi related things. 2. is there also some updating of the shadow technology planned (shadows from all light sources etc) or is the dev branch pretty much the extent of what we will see in Apex? I really like this update. The only way I can describe it is it feels like I'm playing something on Unreal Engine. (And that's in a good way). The LODs are pretty much rock solid, which is really important to me. Out of interest, hjave you added your geometry occulder tech yet, or is that still to come? Couple of bugs in this video. They seem to kinda loiter and just move around back and forth, and at (I'm assuming) midnight, they seem to totally reset and make a totally new formation. This happens around 19 seconds in the webm. I've seen other A3 timelapses and I haven't noticed this issue so I'm guessing it was introduced with the visual update.